Sometimes referred to as the Sturmpanzer II Bison, the15 cm sIG 33 auf Fahrgestell Panzerkampfwagen II (Sf) was a German self-propelled heavy infantry gun used during World War II. The 15 cm sIG 33 (Sf) auf Panzerkampfwagen I Ausf B built in time for the Invasion of France in 1940 had proven to be too heavy for their chassis as well as enormously tall. The same gun was mated to the Panzerkampfwagen II chassis in an attempt to drastically lower its height while using a stronger chassis. The prototype used a standard Panzer II Ausf. B chassis when it was built in February 1941, but this was too cramped for use. The chassis was lengthened by 60 centimetres (24 in), which required adding a sixth roadwheel, and widened by 32 centimetres (13 in) to better accommodate the gun while preserving its low silhouette. 15 millimetres (0.59 in) plates formed the front and sides of the open-topped fighting compartment, which was also open at the rear. Its sides were notably lower than the front which made the crew vulnerable to small arms fire and shell fragments. Large hatches were added to the rear deck to better cool the engine. The 15-centimetre (5.9 in) sIG 33 gun, for which 30 rounds were carried, could traverse a total of 5° left and right and used a Rblf36 sight. Twelve were built at the end of 1941 and shipped to North Africa in early 1942 where they formed schwere Infanteriegeschütz-Kompanie (mot.S.) ("Heavy Self-propelled Infantry Gun Company") 707 and 708. The former was assigned toSchützen-Regiment 155 and the latter to Schützen-Regiment 200, both part of the 90. leichte Afrika-Division. Both companies fought until the Axis surrender in Tunisia in May 1943. As Dragon tool-makers march through the catalogue of German WWII military vehicles, the subjects get more and more esoteric. So it is with the Bison II. 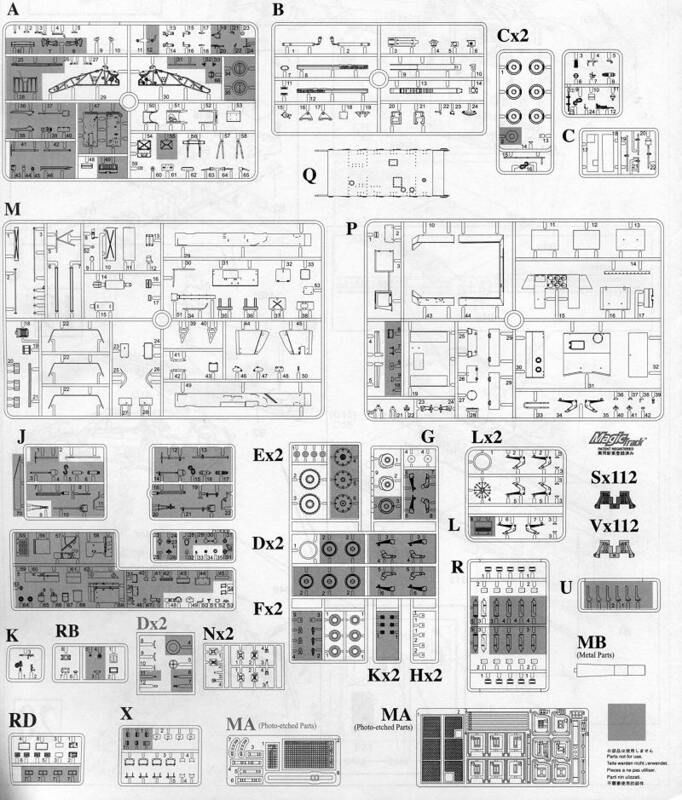 Basically a stretched Panzer II, you will find a number of parts and pieces from previous kits. 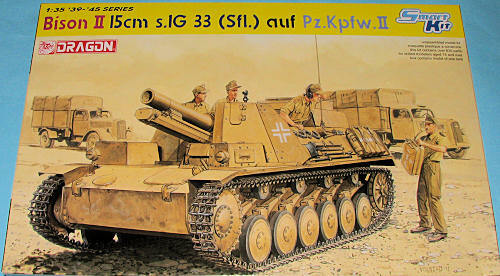 This includes their tried and true SiG 33 artillery piece, a kit that is a beauty all in itself. Earning its Smart Kit title, this one has two small photo etch frets that are mostly for screens and hull attachment bits. It also has Dragon's well received Smart Track individual link tracks. As time consuming they are to assemble, they really do add a lot to the look of the finished kits. 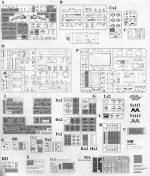 They also make up a goodly chunk of the 630 parts that comprise this highly detailed kit. Since this is an SPG, Dragon has included a fairly well detailed interior that includes a number of new bits and pieces. I shall defer to the Dragon PR department in listing all the features of this one. There are seven markings options in either overall Panzer Grey or Panzer Sand with a couple of the latter enhanced with large areas of Panzer Grey. The Grey ones are from unknown units in Germany during 1942 while the others are with either Schwere Infanteriegeschütz-Kompanie 707 or 708. The small decal sheet is well printed and provides what few markings these vehicles carried. Thanks to www.dragonmodelsusa.com for the review kit. You can get this today at your local hobby shop.